Making-Healthy-Choices e-Zine #007 - How processed are you? "One-quarter of what you eat keeps you alive. The other three-quarters keeps your doctor alive." Recently I gathered with some friends to view the documentary Processed People - a great little film showing the state we are in today. This film is 3 years old but, unfortunately, not much has changed since it was made and in some cases the situation has even gotten worse. Why do we eat so much processed food today? Why do we allow our thoughts to be processed through the television and mainstream media outlets? It is time to wake up, to remember that our bodies are designed to be healthy, to think independently, to follow our natural instincts and to eat real food. If you are reading this newsletter you may already be one that makes healthy choices but no doubt you know people and see people every day that don't. Share this movie with them and watch it yourself to become even more empowered to stay on the healthy path. Processed People - The Documentary is only about 40 minutes long, just over half hour. Why not invite some friends over and watch it together? Get a discussion going, become inspired and inspire others! Below are a few other great documentaries that you may like. In last months e-zine, I talked about making healthy choices when buying your clothing. This month, I want to expand a bit on that topic and direct you to a great resource to help you while you shop. Where and how are the materials sourced? Who handles them and under what conditions do those people work? Is the environment around the factory damaged by production? How do I know any of this information when out shopping??? How do I choose the best product without spending hours doing research first? Well I have just the thing to help you. There is a wonderful group of people that have done all this research for you and have created a Good Guide rating system. Click here to read more about this important topic and the Good Guide. Want a fun way to eat more nutritious greens? Want a crunchy crispy snack that is also good for you? Want something to replace that potato chip craving? Kale chips may be just the thing you are looking for. Kale is a dark green leafy vegetable that is highly nutrient dense and has many cancer fighting properties. So, not only will you be eating a great tasting crunchy and satisfying snack but you will also be doing your body a world of good! It doesn't get better than that. Kale chips can be made in a variety of flavours, the favourite in our home being the nacho cheez flavour (vegan and dairy free). When you break kale into pieces and dehydrate it will become a crispy chip. Coat the kale before dehydrating with the flavourings of your choice and there you have a fun and healthy snack. Serve them in a big bowl during a party, as a side dish instead of fries or as a snack when travelling. 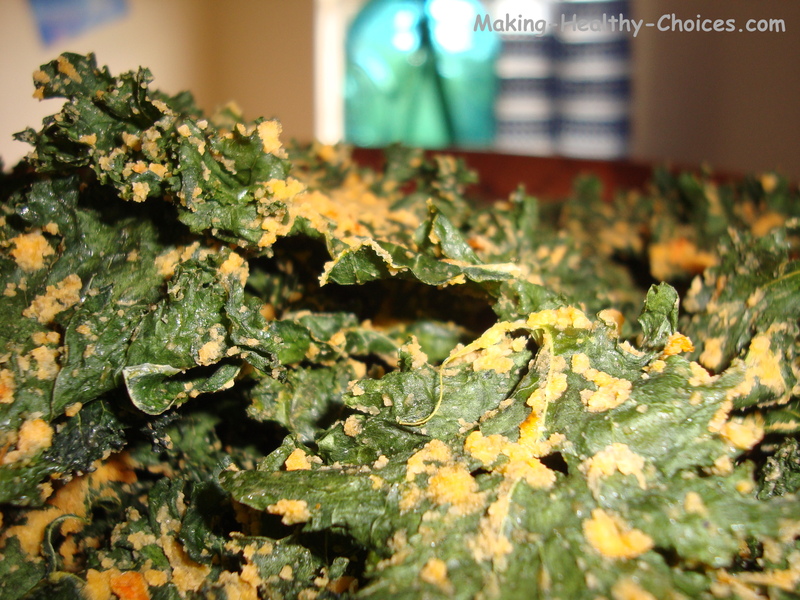 Click here to see the full kale chip recipe. Try the recipes on this page or experiment with ideas of your own... Let me know if you have a great kale chip recipe and I will feature it on the website.